In this post, I will attempt to set the historical record straight and provide the history of this house. He and his wife Ida sent their only child, Martha Gladys, to St. Katharine’s Hall, a college preparatory school in Davenport, Iowa that was associated with the Episcopal Church. Born in 1886, Gladys probably graduated in 19057 and then went to live with her parents in Chicago. 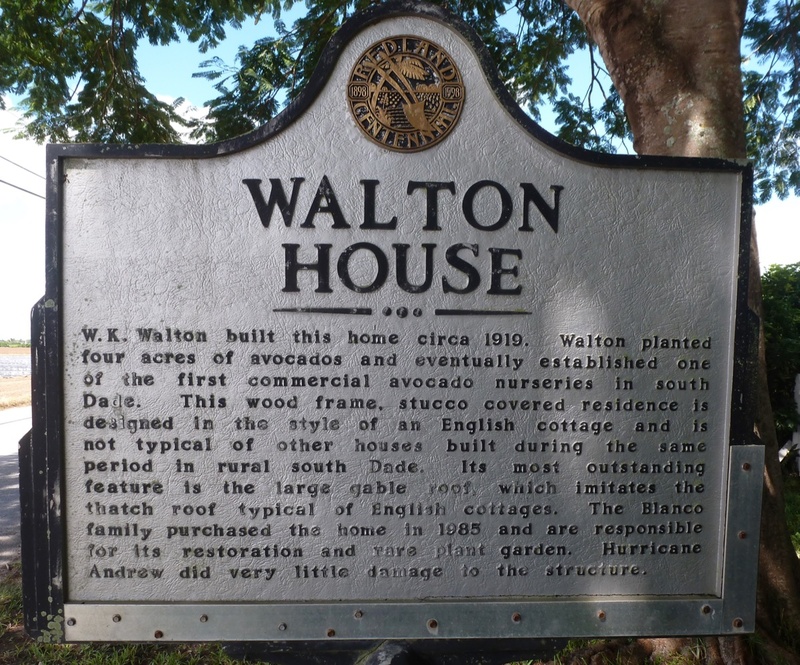 The real estate boom in the Miami area was nationally known and W. K. Walton no doubt read about it in the Chicago papers. 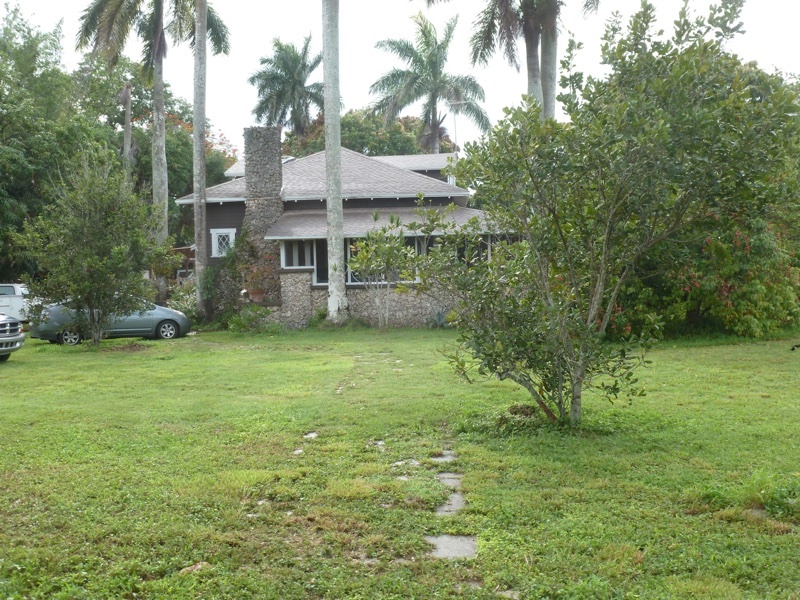 The couple came to Miami shortly after their marriage and may have purchased 10 acres in the vicinity of N.W. 30th Avenue and 68th Street. 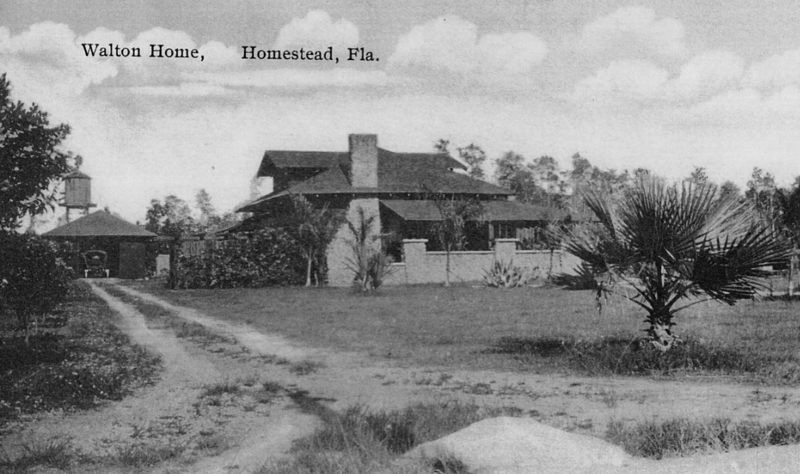 Karl sold that property to Louis G. Hagan in August of 1914,8 after he had claimed the relinquishment of a homestead claim northwest of Homestead on June 27, 1912.9 That property had originally been claimed by Charles B. Firman in July of 1907 so there may have been a small house on the property when Walton picked up the relinquishment from Otho Heath. Walton sold some of his acreage not long after he paid cash for it on December 25, 1913. The name of the property was Rimrock, according to a mention of it in the January 26, 1923 issue of The Homestead Enterprise. Apparently, the Waltons, who were upper middle-class, were not happy being so far out in the country – way out between 212 and 217 Avenues and 280 and 288 Streets. 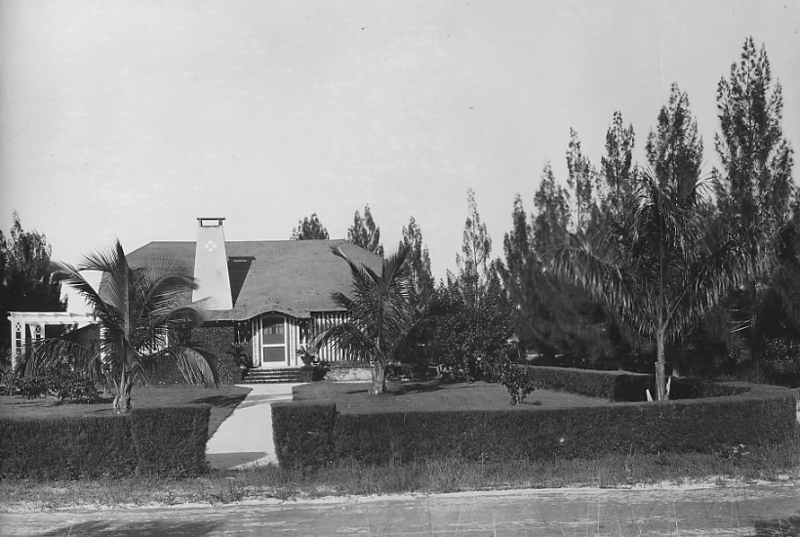 Thus, Karl purchased land closer to Homestead from Bird Fitzpatrick, at the northeast corner of Biscayne Drive and Redland Road. Fitzpatrick had claimed that property, part of the northwest quarter of 1-57-38, as his homestead on June 11, 1906 and proved it up on February 27, 1912. While Gladys was caught up in the social scene, Karl was busy establishing groves and making a name for himself in the avocado nursery business. On September 13, 1918, he registered for the draft in Homestead and stated that Gladys F. Walton was his wife. But the marriage must have been troubled, for on November 25, 1919, he married Miss Margie M. Smith, of North Adams, Massachusetts, in a quiet ceremony in West Palm Beach.14 In December of 1918, The Miami Metropolis noted that Gladys was with the Florida Conservatory of Music and Art at Biscayne Drive and Collins Avenue in Miami.15 She subsequently established a career as a well-known teacher of ballroom dancing to the elite in Miami. 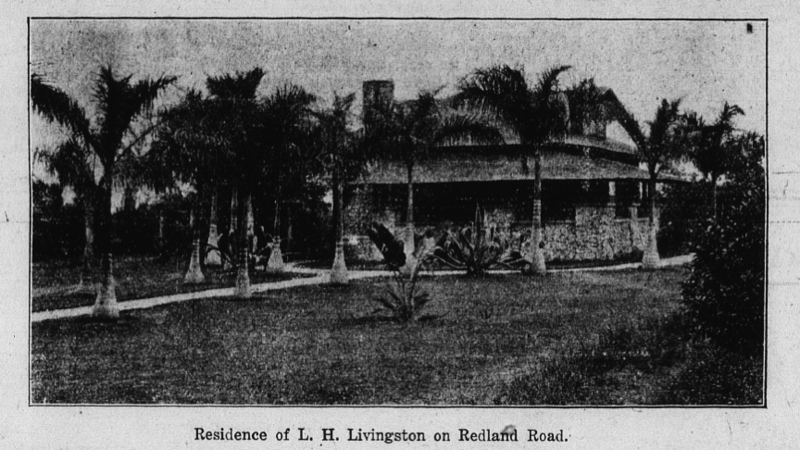 Back in Homestead, Karl was busy with his grove business, having sold his house after his divorce in 1919 to Lindley Hoffman Livingston,16 17 18the brother of Anthony Rutgers Livingston, a prominent civil engineer in Homestead who owned the Homestead Engineering Co.
Waltonhurst as it appeared in the March 30, 1923 issue of The Homestead Enterprise. Melvin P. Wollam was the Wollam in Wollam & Kendrick Grocers in Homestead and Alec C. Smith was a carpenter who worked for him. This second Walton house is now a well-known wedding venue. A. R. Livingston purchased Elliott Prouty Livermore’s 80 acre grove on Epmore Drive, (named for E. P. Livermore) in 1926.25 He apparently sold his late brother’s house to Livermore at the same time, perhaps as part of his purchase of the grove. The house was recently placed on the market but it has not sold. If it sells, hopefully the person who buys it will understand its place in the history of the Redlands. The identity of this person is unknown. He was probably not a local resident. Photograph in the collection of the Library of Congress. Another great piece of research. Thanks. How could I have lived all these years, and not known these facts! Kudos to you. Another wonderful article. Thank you, Jeff for all you do in researching our community. Great research! Always a pleasure to read your findings! Thank you for sharing your passion!! Love to read all the history of my hometown! I can’t wait to read this to my mom, she will really enjoy this! Thank you Jeff for all of your hard work. Great article, Jeff, as always, well researched and thorough. Jeff, your fine work continues! The new owners are no strangers to Walton’s story, and they are very excited to bring the property back to its former glory! Great article… if you have any knowledge about Thomas Piché, the gentleman that was William Krome’s secretary, I’d love to hear it. It’s an important remainder of the pioneer era and well deserves your attention and research. Thanks for sharing another bit of local history. Great article Jeff, Thank you! I always enjoy reading things like this, especially when my family is the one being described in the article. My grandmother is the granddaughter of William Karl Walton and Margie Smith Walton. My grandmother remembers visiting this house only once, but as she recalls, it really was a nice house. We have a few pictures of my grandmother’s father at the Walton House and of the laborers who worked with the avocados, etc.